I made a discovery the other day that really surprised me. 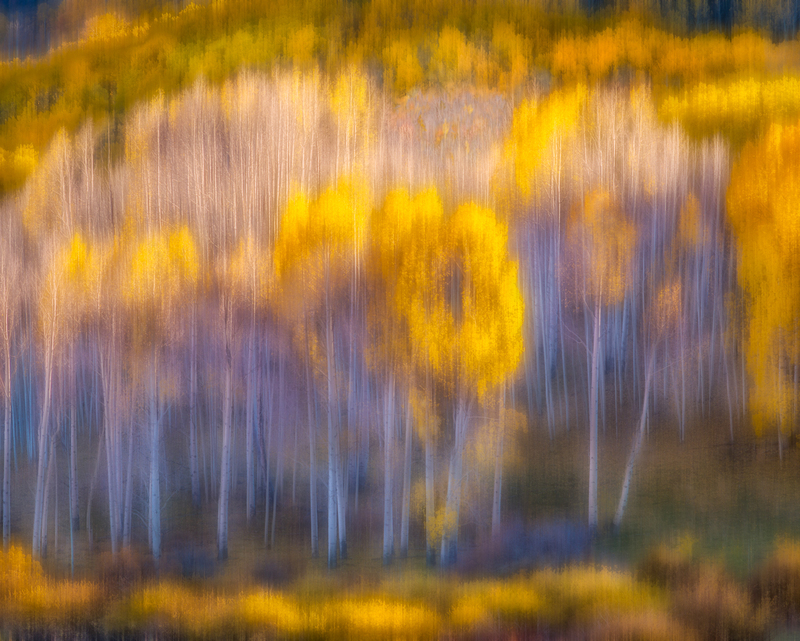 I found a folder titled “blurred after”, and in it were a few images from last years trip out west that I had obviously experimented with and had completely forgotten. I have always leaned toward a painterly expression in my photography and occasionally, I will work with a scene, taking a “straight” shot in focus and add another (or several others) blurring the image by moving the camera while the shutter is open, or intending to create a blurred image in post processing using a few filters in Photoshop. For the photo above, it was originally taken in sharp focus while the blur was achieved using both a Gaussian and motion blur in Photoshop; the amount of each affect can be controlled to your own taste. While working with a photograph in the digital darkroom, you are completely free to manipulate the colors, light values, contrast, etc. in order to create an image true to the original scene, or something a bit different from the original based on your own creativity. It’s a liberating process and can be enjoyable if frustration doesn’t set in when facing your own inability to get on the screen what it is you see in your mind. I think it was that frustration with this particular image that caused me to leave it alone for such a long time. There was an area that bothered me and I was at a loss on how to correct it in a way that satisfied my intent. But I suppose, in the intervening months since I originally worked on this one, I may have gained some experience and managed to work through the problem with a few layers, cloning, color and exposure adjustments to finally get to where I wanted to go in this, my second attempt. I was really looking for the image to glow as brilliantly as it was that afternoon, and that one area refused to submit to every previous attempt. But today I am pretty much satisfied after importing the corrected version from Photoshop into Lightroom and adding a few more tweaks to finally arrive at a place where I wanted the image to go. I really felt like I was painting the image, making changes to make it look more like a painting rather than a photograph. I utilized the process of using color to indicate shadows instead of simply darkening an area, using a brush with my own choice of color to achieve that end. 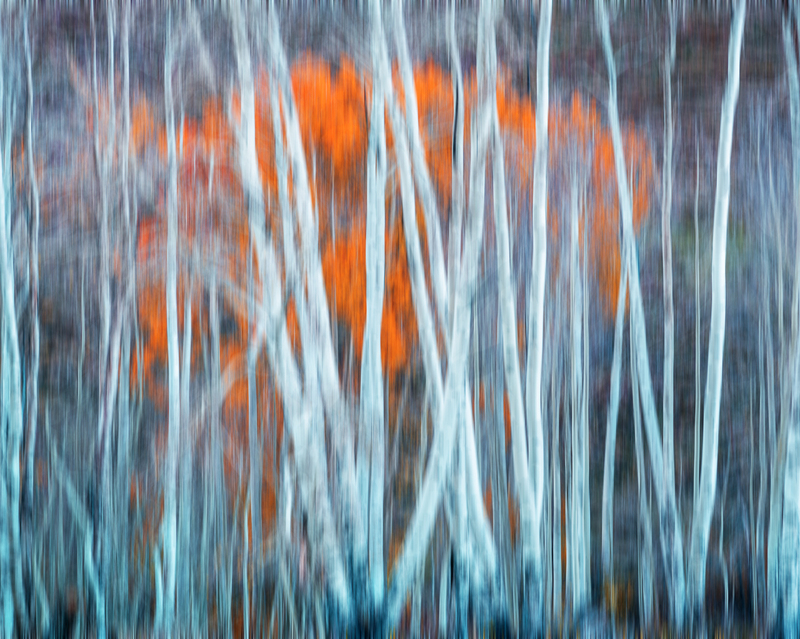 In this second image, I chose to use blue/aqua tints for the aspen trunks that were in shadow while the few remaining aspen leaves that were backlit by the afternoon sun lit up more toward orange. It’s not too often that I’ve seen aspen leaves turn anything other than gold, but they do offer slight variations at times, but they are few and far between. The whole process certainly does lend itself to releasing your own creativity leaving only your imagination as a limit. Abstracts are especially fun to create where color, shapes and texture are the foundation, while your manipulation and experimentation of those can be loads of fun creating countless versions of the same image.